The exotic flavors of Thailand and your favorite Thai restaurant at home with this easy and flavorful Thai grilled chicken recipe. The marinade has cilantro, Thai fish sauce, spicy Thai chilies and white pepper to bring loads of flavor and aromas from your grill. This is great served with a side of Thai fish sauce with lime and chilies. Marinade for 1 whole chicken or 6-8 pieces of chicken. If using a whole chicken cut in half or spatchock for the grill. Thighs work great for Thai grilled chicken! Combine all in a food processor until combined and smooth Marinate your chicken at least 4 hours, overnight is much better. Prepare your charcoal fire for indirect cooking, the coals on one side of the grill. For a gas grill low heat on the side you will be cooking the chicken and higher on the other side (s). Heat your grill until the coals are covered with gray ash, on gas until the grill is around 375 degrees. Remove the chicken from the marinade and reserve the marinade to baste the chicken as it cooks. 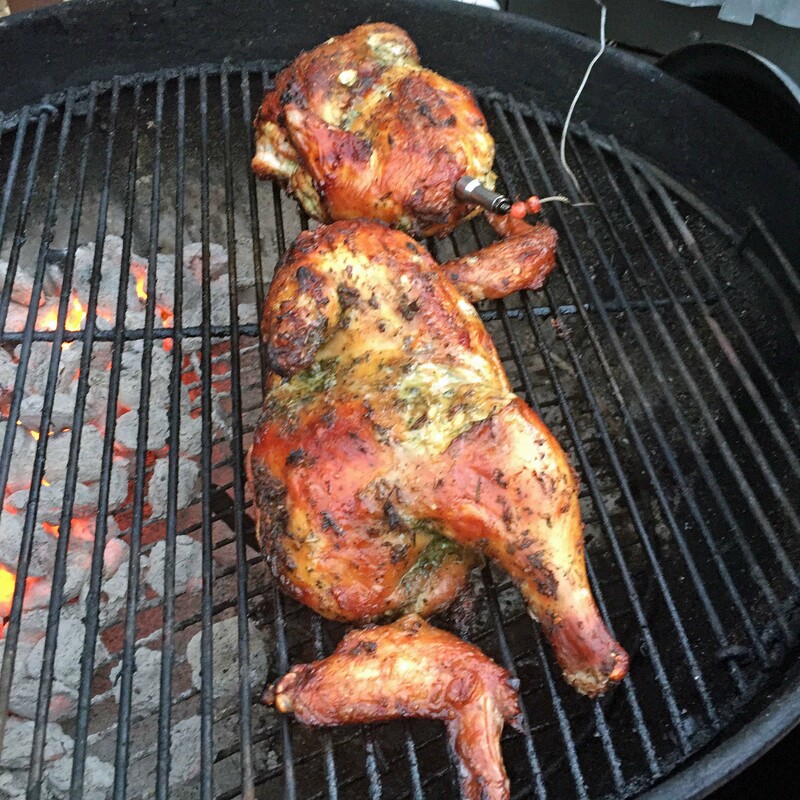 Place chicken bone side down on the indirect heat side of the grill. Cover and cook for around 10 minutes checking for any flare ups. Turn the chicken skin side down for approximately 10 minutes, cover and cook. Turn back over to bone side and baste with the reserved marinade, cover and cook. Cook to an internal temperature of 165 degrees and a nice golden brown skin. Allow 15 minutes for the chicken to stabilize a bit before serving. Excellent served with a Thai Fried rice! I use the ThermoPro wireless thermometer, works great and makes it easy to watch the temperatures! Click on the picture below! Wikipedia at the following link.